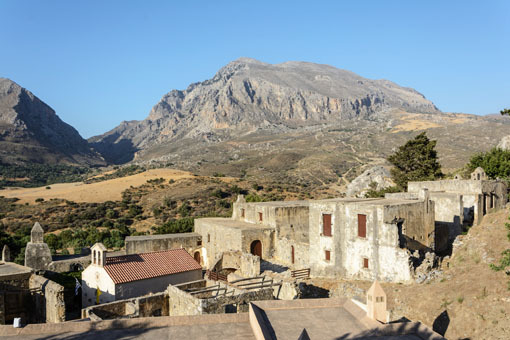 A road trip with friends took us to the south coast of Crete and a monastery famous for much more than religious activities. 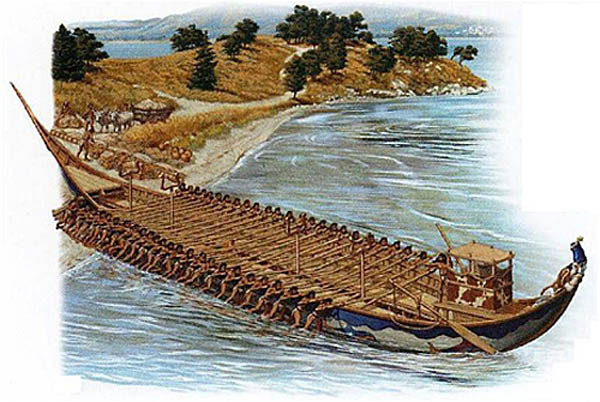 We left our village and traveled west on highway E75 toward the port city of Rethymnon. From Rethymnon, we took the road to the south coast and the Libyan Sea. At Rethymnon we turned south towards Spili, climbed into the White Mountains, and then descended into Kourtaliótiko gorge. This pass was cut through the mountains by many streams that combine to create Megalos Potamos (big river). As we descended the road narrowed. At one point the rock wall was only a few feet from the right side of our vehicle, while northbound travelers were close to a cliff that plunged into the river far below. Winding road through Kourtaliótiko Gorge can be nerve-wracking. The bottom of the gorge opened into a rich alluvial plain deposited by the river over thousands of years. Here the river irrigates productive farmland, green pastures, and wooded areas. We turned eastward, crossing the river at an ancient bridge and climbing into the hills, until we came to the Kato (lower) Preveli Monastery of St. John the Baptist. It was founded during the late 10th or early 11th century. 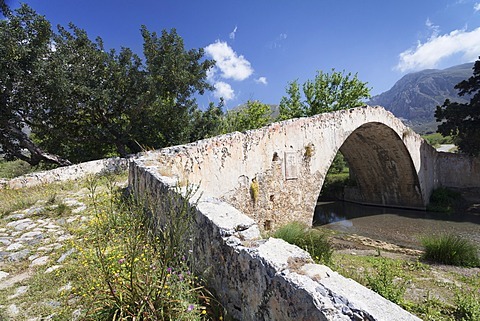 A Venetian bridge over the Megalopotamos near Kato Preveli Monastery. The battered monastery seemed empty, but in the process of being restored. Judging from the surrounding pastures and farmland, it was clear that monks are still tending the land. This is the ongoing history of Preveli. It has been destroyed by enemies many times, but always rebuilt. Kato Preveli Monastery is in the foothills and surrounded by farmland. 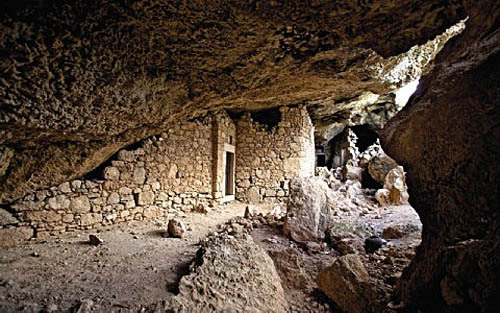 Over several centuries Kato Preveli developed as a religious, cultural, educational and art center for villages in the region, as well as an excellent farming cooperative. 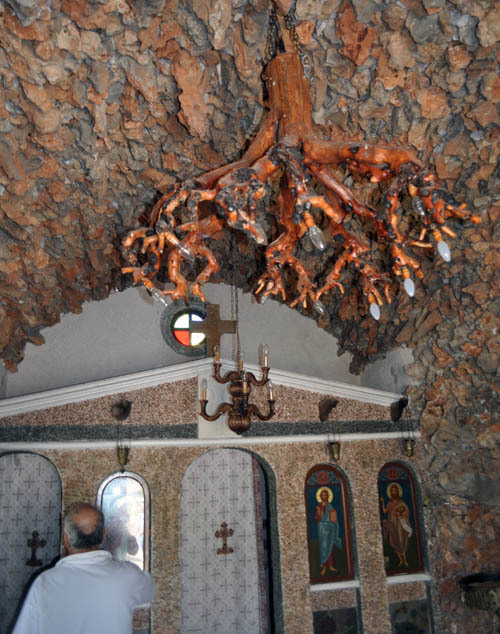 When the Ottoman Turks occupied Crete in 1649, they destroyed churches and monasteries, including Kato Preveli. It was rebuilt with the help of surrounding villages and church funding. 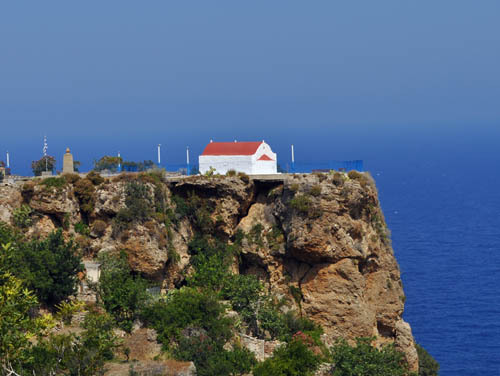 Expecting more bad behavior from the Turkish overlords, they also began building a second monastery (Saint John the Theologian) on a high ridge overlooking the Libyan Sea. This monastery, called Piso (back) Preveli, was fortified and difficult to reach. Fortunately, the modern road made our climb easier than it was in earlier centuries. 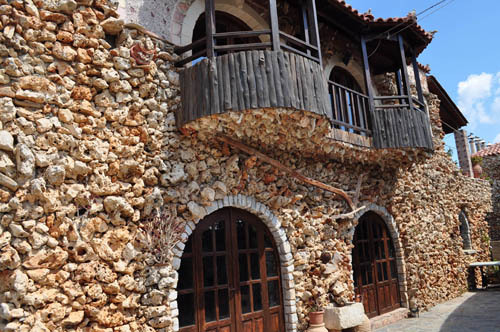 The first impression of Piso Preveli is one of strength. It looks like a fortress. 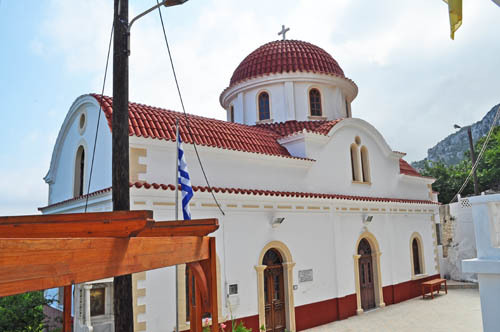 Responding to the harsh Ottoman regime, Preveli became a leader in the struggle for Cretan freedom — in addition to their traditional spiritual and educational activities. The abbot and his monks established spy networks for information gathering and infiltration in the highlands. They also provided support and shelter for rebels fighting the Turkish overlords. 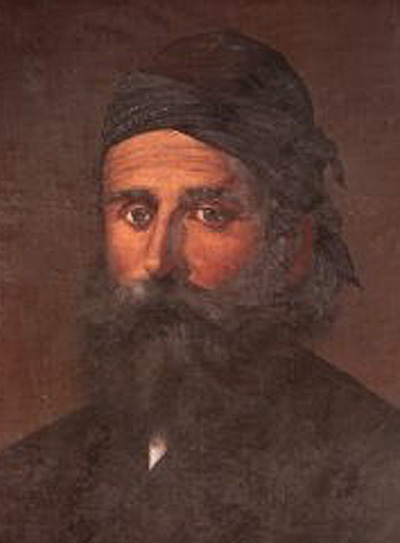 The first Cretan revolt against Ottoman rule (in 1770) was led by Ioannis Vlachos, a wealthy ship-owner from the mountain village of Anopolis. Because he was educated, some people called him ‘Daskalos’ (teacher). By adding his first name, he became the famous Daskalogiannis (Teacher John). 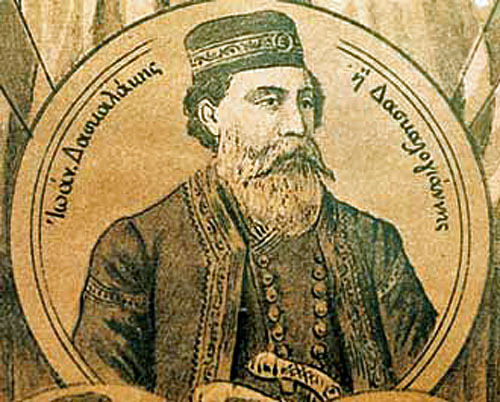 Daskalogiannis agreed to fund and organize a rebellion against the Turks after Count Orlov of Russia promised him military support and naval ships. However, Orlov was lying. He only wanted to distract the Turks from Russian attacks elsewhere in the Ottoman Empire. Without the Russian support, the rebellion was crushed and Daskalogiannis was publicly executed. 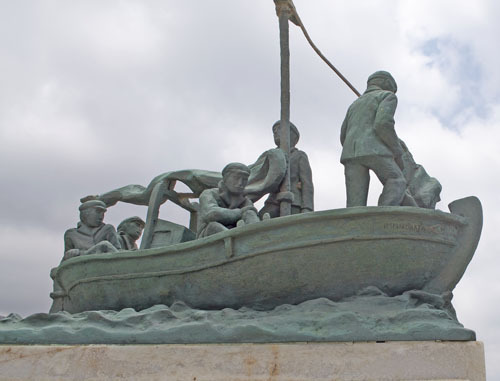 But Cretans do not give up easily, and even more freedom fighters joined the cause. 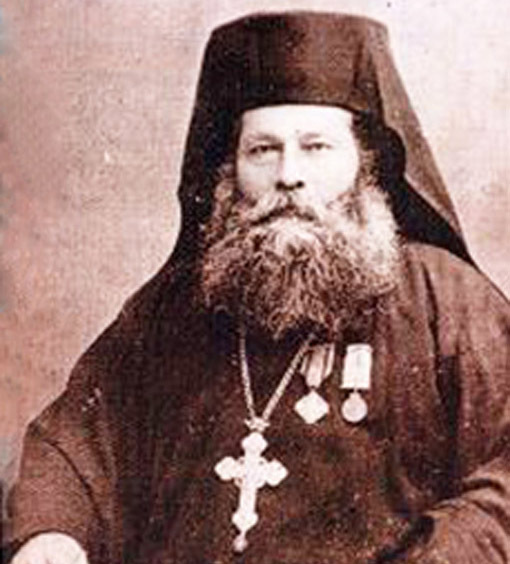 Abbot Efraim Prevelis was one of the organizers of that revolt. He provided supplies and armed monks to the rebel cause, as well as secure hideouts and launching points for raids against the Turks. He also encouraged the Cretan fighters by carrying a holy artifact (known as the Preveli Cross) into battle. He continued in the resistance for the rest of his life, and abbots who came after him followed this tradition. Abbot Melchissedek led a group of monks and rebels during the Greek War of Independence in 1821. In retaliation, the Turks attacked Piso Preveli, but it was rebuilt and the monks continued their resistance. The abbot died of battle wounds in 1823, but those who came after him continued to organize and support rebellion against the Turkish overlords. 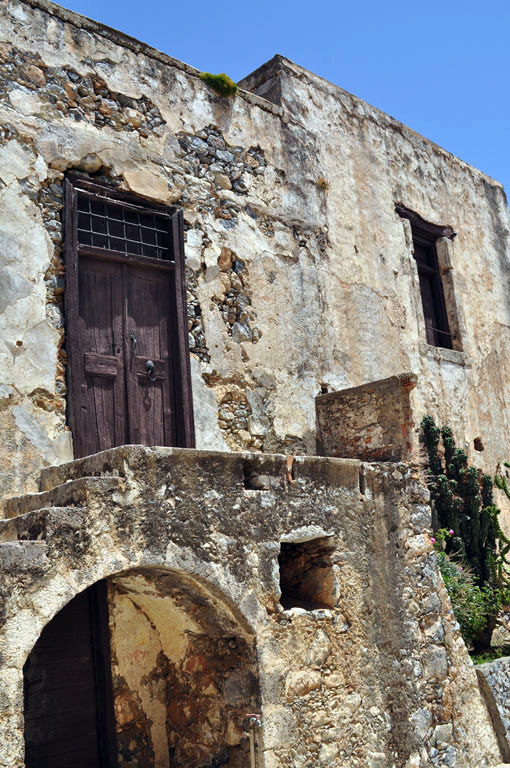 Because of its strategic location, Piso Preveli was an important base for freedom fighters. During the revolution of 1866, the beach below the monastery was a drop-off point for delivering guns and ammunition to freedom fighters. 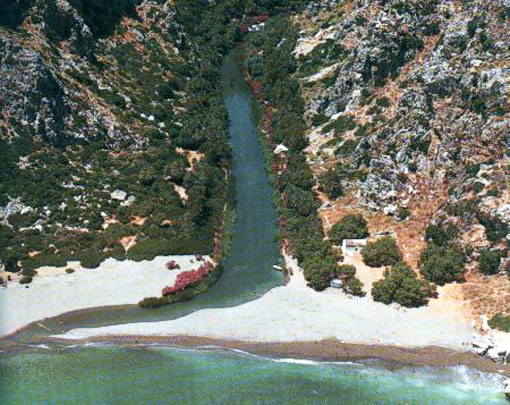 Sandy cove below Piso Preveli was an ideal place to deliver weapons. 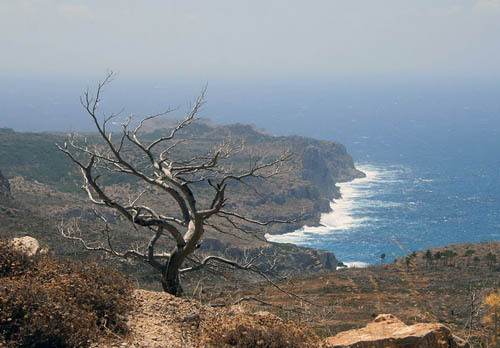 Under Abbot Agathangelos Papavassiliou, Preveli supplied rebels at Arkadi, a fortress monastery north of Preveli. However, the rebel activity at Arkadi angered the Turkish ruler (pasha), who sent and army of 15,000 to eliminate the problem. 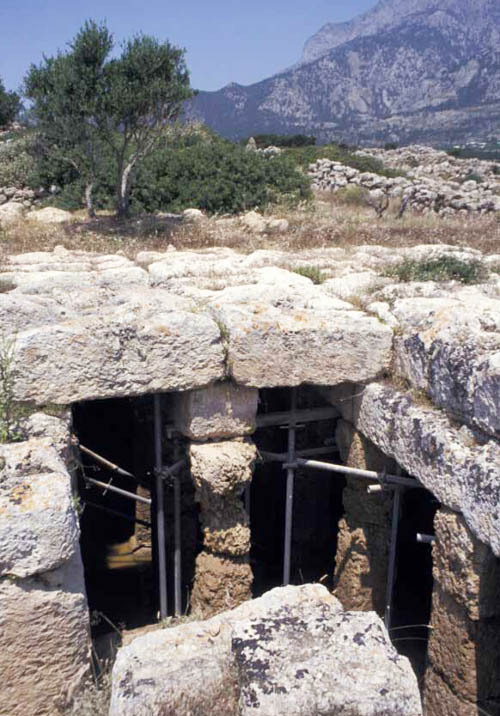 The 259 Arkadi defenders refused to surrender, so the Turks began a siege that lasted several days. Rifle fire and cannons gradually reduced the defenders, until only a few were left. These men joined the monks and refugees in the gun powder storage room. They all voted to die rather than surrender. 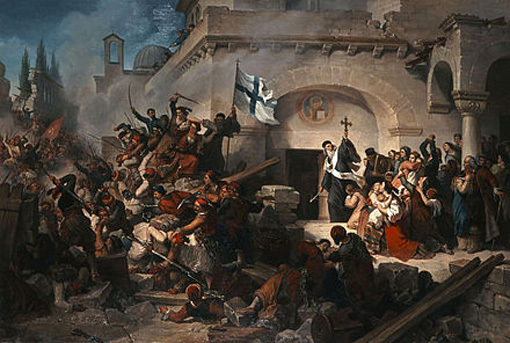 As the enemy swarmed into the monastery, the gun powder was ignited — killing most of the Cretans and even more Turkish soldiers. This event became known as “the Arkadi Holocaust,” and it changed world opinion about the Ottoman Empire. Volunteers from America and European countries began arriving in Greece and Crete to fight. 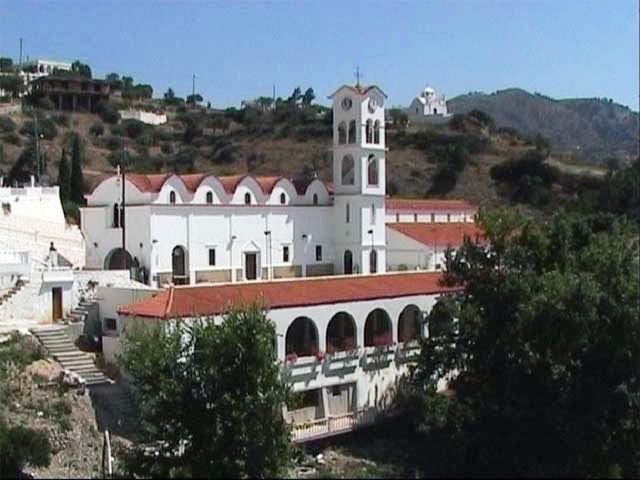 Preveli Monastery increased its efforts to support the rebellion, and armed monks fought against Turkish soldiers trying to enter their region. 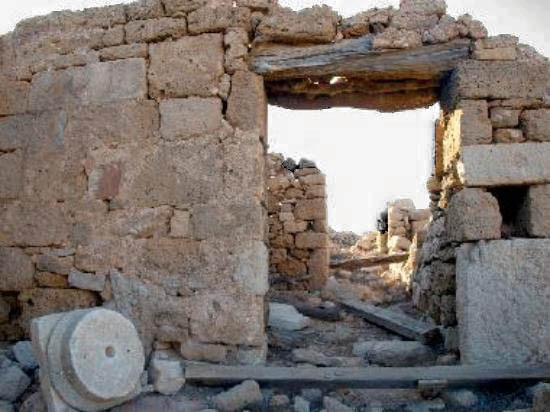 The Turks retaliated against Preveli’s suspected role in the Arkadi disaster by attacking the lower monastery, destroying the church and ravaging farms in neighboring villages. Again the monks responded in their usual way: the church and other buildings were renovated, and farming equipment was repaired or replaced. 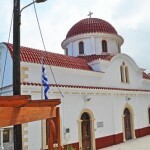 The Piso Preveli church has been repaired often over the centuries. The monks had a custom that continues today. Whenever they face a difficult situation, they shout a prayer to their protector: “Saint John, there’s a little dust in your courtyard, go in and out and clean it!” It means that whatever enemy or problem comes along, get busy and fix it. The monastery recovered quickly from disasters, and it was constantly focused on the national cause of freedom. 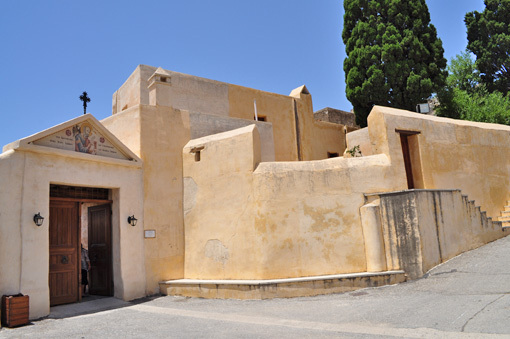 For the next 30 years, the monks were active in organizing rebellions against the Turks, which helped bring about Crete’s eventual independence in 1898. The warrior monks then went to fight against Turkey in the Balkan Wars. This led to the collapse of the Ottoman Empire, and freedom for other countries. 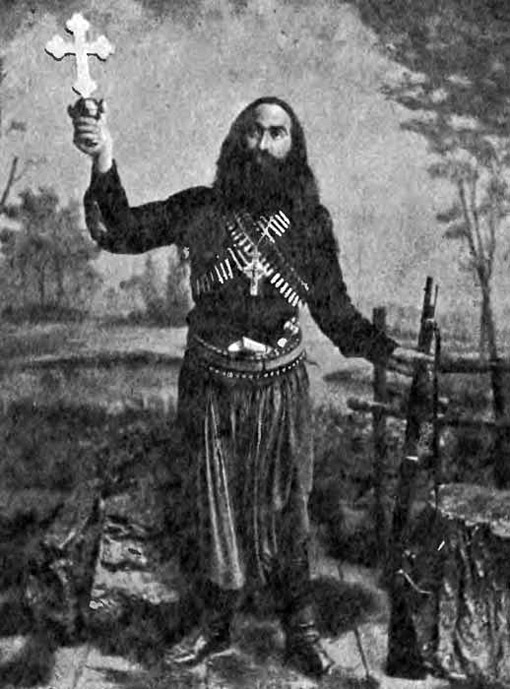 Papamalekos (father Malekos), armed and ready for battle in 1897. 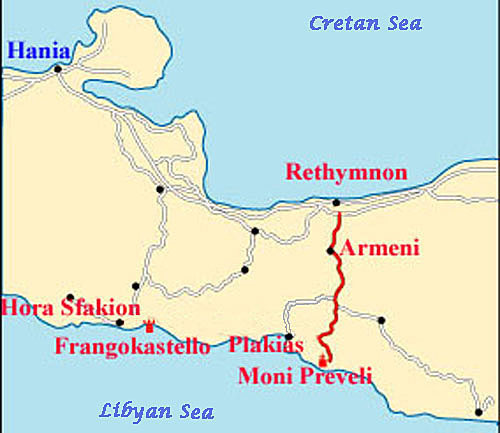 After the liberation of Crete and its union with Greece in 1913, Preveli returned to its religious, farming and social activities. Unfortunately, peace did not last — Nazi Germany started a war. 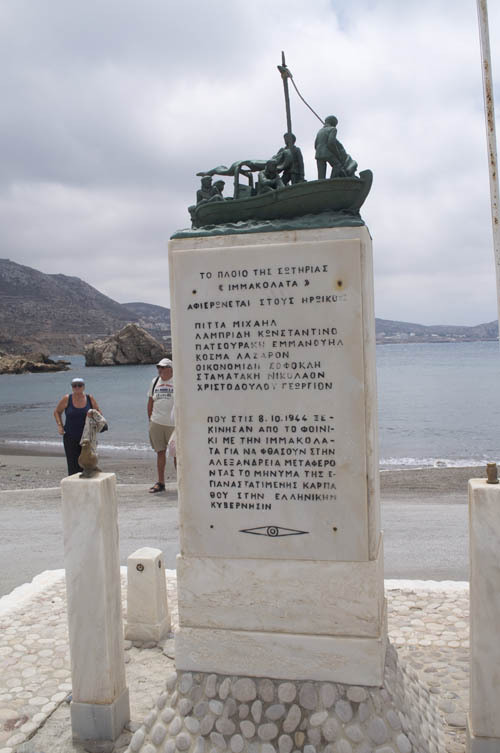 In May 1941, thousands of German invaders landing in western Crete met fierce opposition from Allied troops and Cretan people — including women and children. Nazi officers retaliated by ordering the massacre of entire villages. 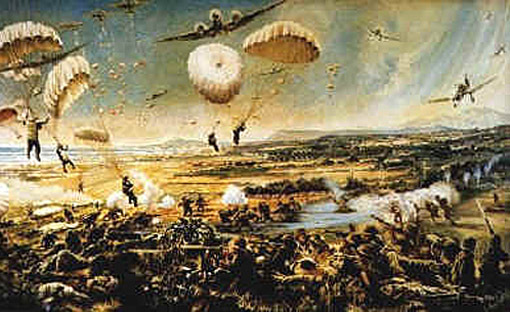 Artist’s depiction of the German assault at Rethymnon, north of Preveli. 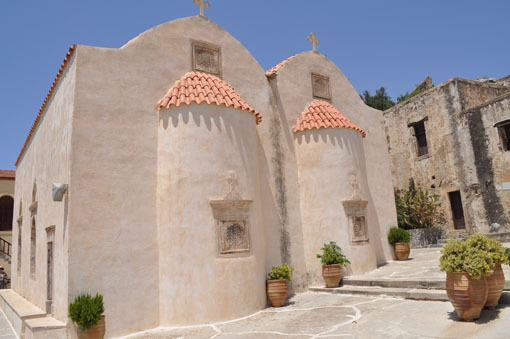 Faithful to its traditions, Preveli monks supported Cretan resistance and Allied soldiers during fierce battles near Rethymnon. However, the defenders were overwhelmed by enemy soldiers, aircraft and war machines. 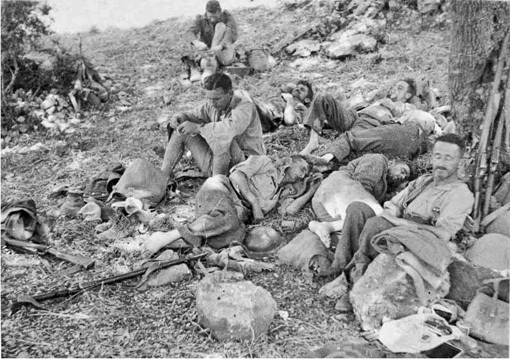 After most of the Allied troops and remnants of the Greek Army were evacuated, 5,000 soldiers from England, New Zealand and Australia were stranded on the island. For these men, the monastery and neighboring villages offered safe shelter. Resistance fighters protected allied soldiers from the German invaders. 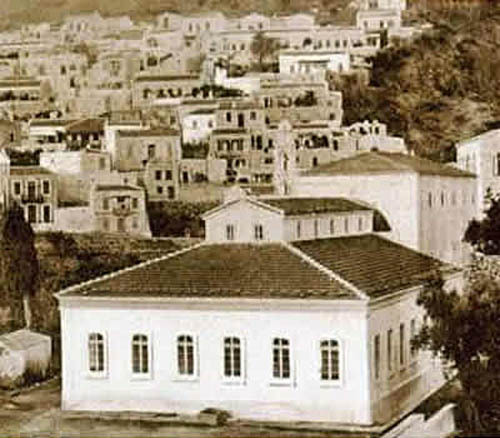 Abbot Agathangelos Lagouvardos organized his monks, local villagers, and resistance fighters operating in the mountains to hide, defend and feed the stranded allied soldiers throughout the German occupation of Crete. He also helped arrange for their escape. 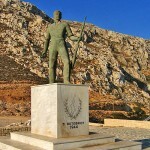 Agathangelos organized resistance forces and protected allied soldiers. 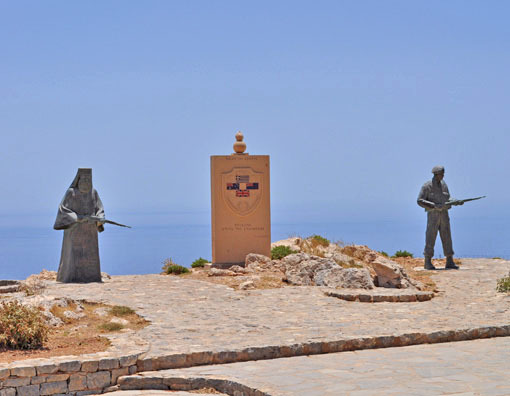 A group of Allied soldiers managed to contact a British submarine and — with the help of Preveli monks — were able to escape to the Middle East. 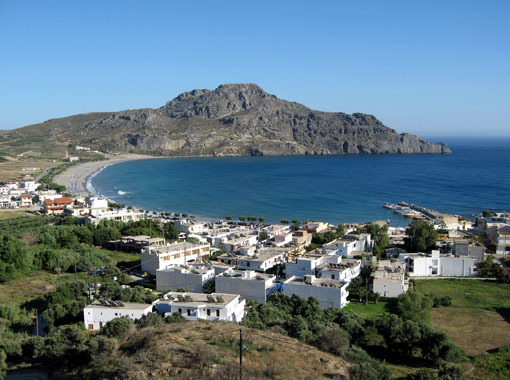 Two rescue missions were organized by submarine from the beach below Piso Preveli. However, the second mission came to the attention of the Germans, and soldiers were sent to the monastery. Abbot Agathangelos went into hiding and the monks of Kato Preveli fled before the enemy arrived. New Zealand soldiers waiting to be evacuated by the resistance forces. 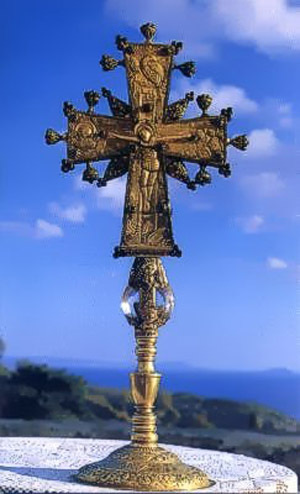 After stealing or destroying everything in the lower monastery, some of the German soldiers moved on Piso Preveli, where they took anything of value — including a precious relic: the Cross of Ephraim Prevelis. The Germans later returned it to the monastery under almost miraculous circumstances (every airplane assigned to take the cross to Germany mysteriously failed to operate). Still searching for the abbot, three German officers later came to Piso Preveli and interrogated the monks, but got no information. 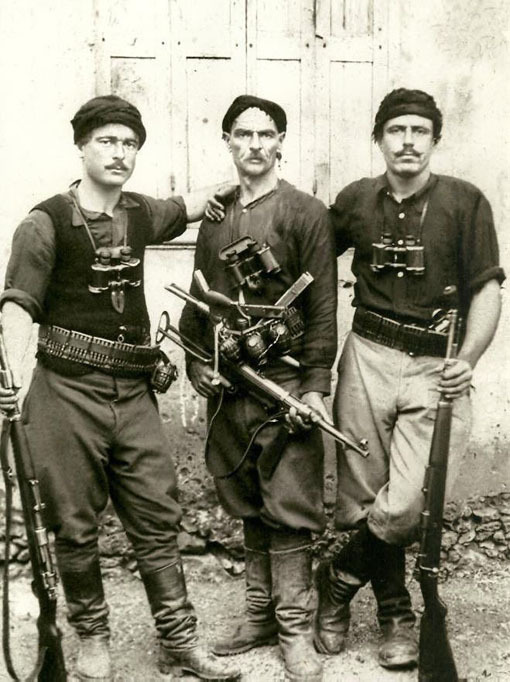 The frustrated officers arrested the monks and charged them with possessing guns and a radio, and providing care to British fugitives and Greeks. 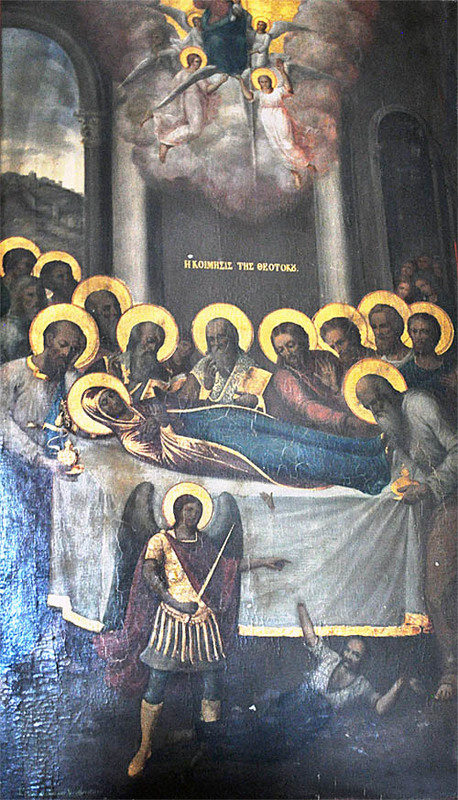 After the Orthodox Church intervened, the monks were released. 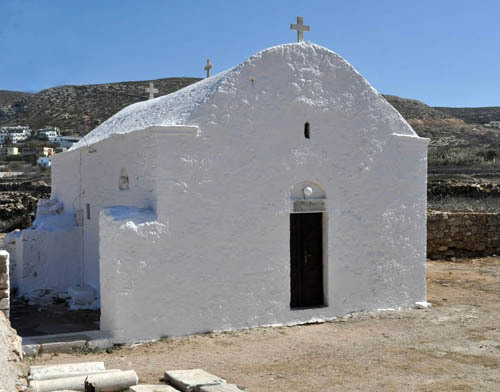 They returned to find the monastery badly damaged — and so began to rebuild with the help local people and other Cretan monasteries. The enemy kept a close watch on Preveli, but the brave monks never stopped caring for hidden allied soldiers or giving information and support to the resistance movement operating in the nearby mountains. When the Axis forces finally surrendered and were expelled from Crete, Preveli helped the hidden soldiers return home — amid great celebration. 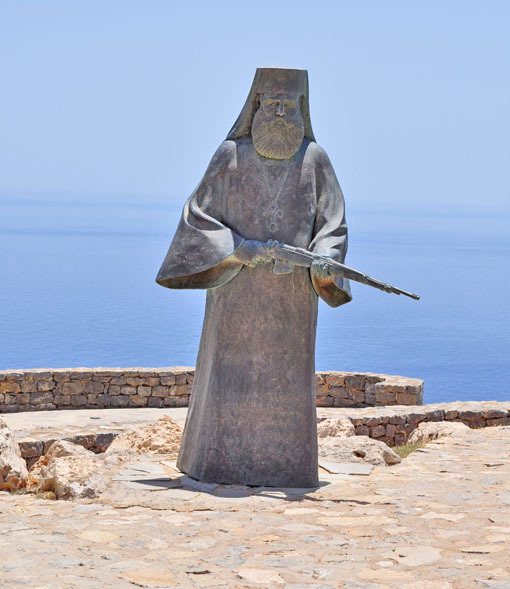 Sixty years after the German invasion, a memorial was proposed by allied soldiers who survived only through the protection and support of the Preveli monks. This memorial — on the edge of a cliff outside the monastery — was officially opened a year later, on May 25, 2002. It includes a memorial plaque citing the role of Preveli monks in rescuing allied soldiers. This is flanked by two figures carrying rifles. The one on the right is a soldier. On the left is none other than Abbot Agathangelos, the man responsible for saving the lives of many stranded soldiers. 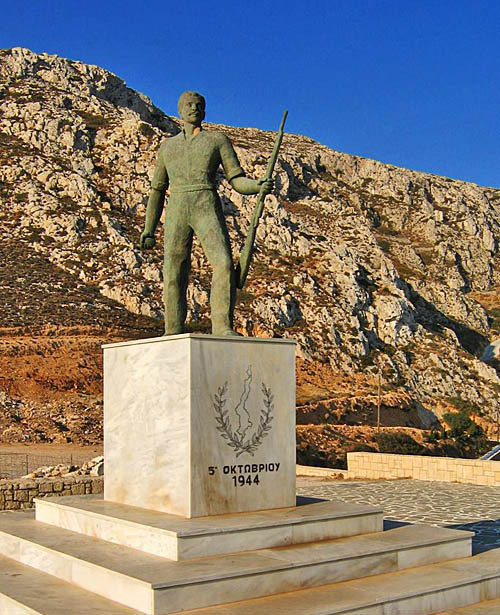 Statue of Abbot Agathangelos in the Preveli war memorial. 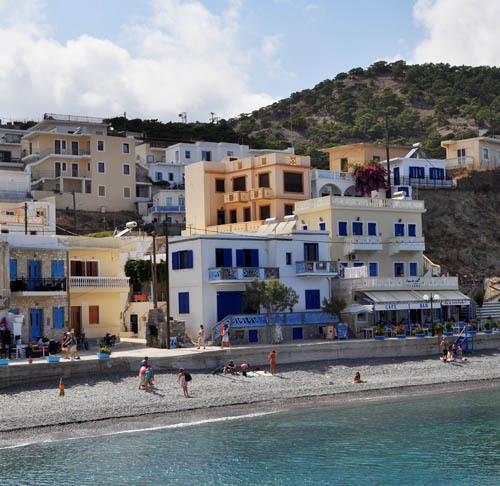 After exploring the well-kept monastery grounds and buildings, we left the stoney ridge and traveled down to the village of Plakias, with its seaside tavernas and good food. 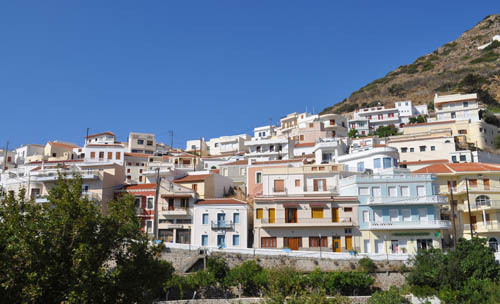 Plakias is a pleasant village not far from the monastery’s stoney ridge. What is creativity? It is the act of turning a unique idea into something we can see, hear, smell, touch, or taste. We think of great works of art — paintings, music, dance, and so on. And we sometimes recall famous creative people. However, anyone can be creative in one way or another. While traveling in western Crete, we discovered a good example of this. In the beach town of Kalyves, we turned inland towards the White Mountains (Lefkas Ori). 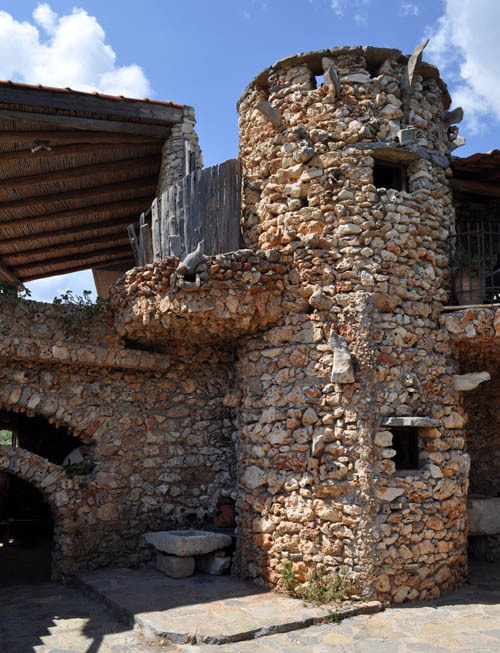 On a hill not far from Kalyves we came upon a whimsical wonderland called Koumos. Koumos is imagination made real. 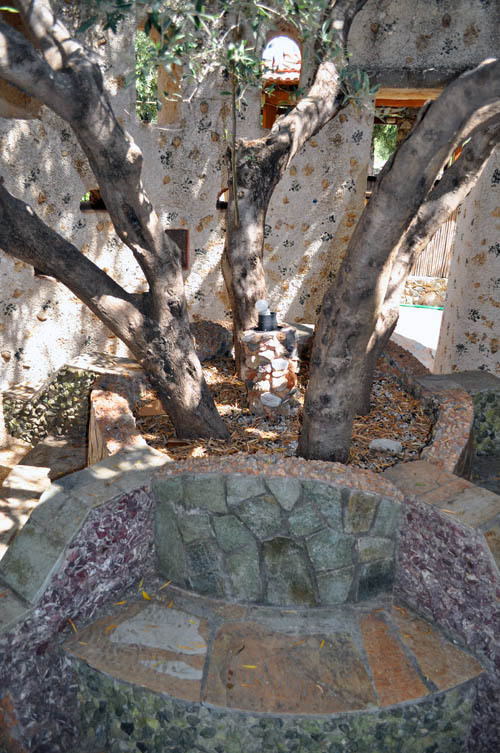 It all started in 1990, when the wife of Giorgos Khavaledakis suggested that he build a stone table in the garden behind their house. Giorgos thought about the project, and came up with a fanciful way to accomplish it — encrusting the sturdy supports for a stone tabletop with small stones and colorful bits of ceramic. This inspired him to attempt other projects, which became an obsession over the next 14 years. 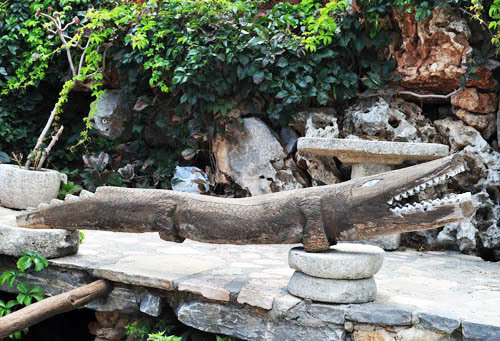 He carried selected stones and rocks down from the mountains to create all manner of distinctive buildings and artwork. 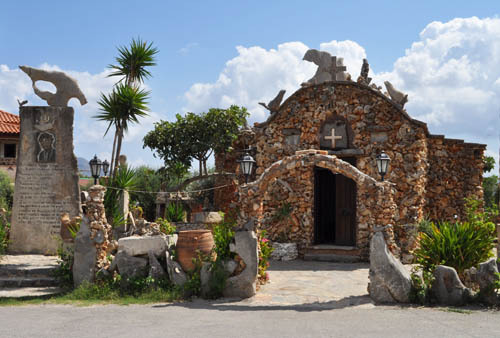 Intricate stone mosaics and fantastical sculptures cover the house, taverna, chapel, a small museum and every other building in the complex. 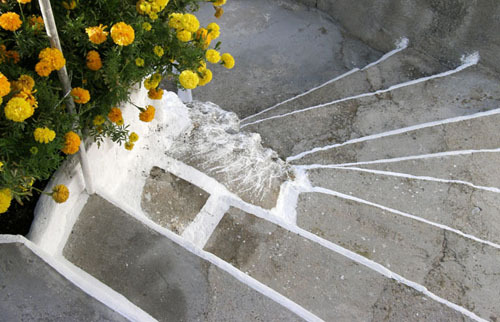 Although he was not a trained artist or architect, the creations of Giorgos Khavaledakis are delightful and strangely compelling. 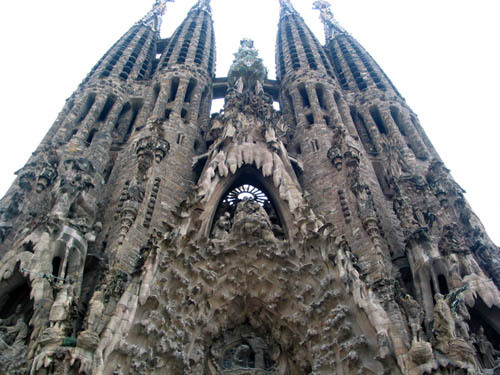 In fact, they are similar in some ways to the work of Antoni Gaudi (1852 – 1926), the best known practitioner of Catalan Modernism. 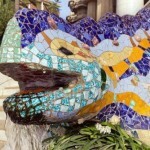 Because of his designs, Gaudi’s name was transformed into the word gaudy, meaning extravagantly bright or showy. 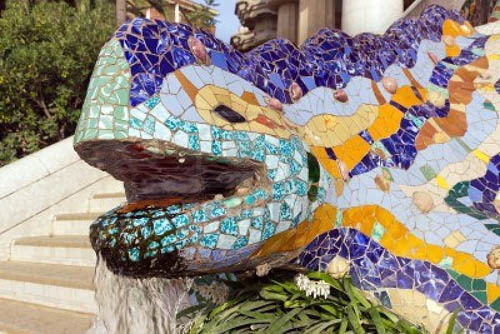 No one questions the creativity of Gaudi, nor should they question that of Giorgos Khavaledakis — a self-made artist. 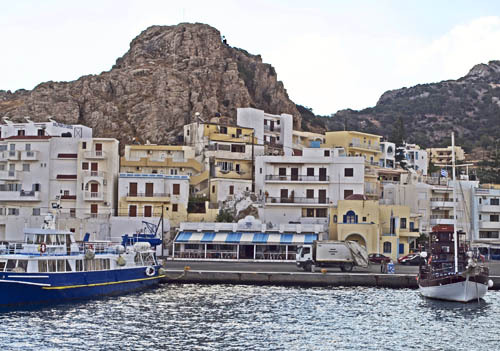 Traveling with Cretan friends, we boarded a ferry at the port of Iraklion bound for Karpathos — an island at the eastern corner of the Cretan Sea. After a boring eight-hour voyage, we finally drew near the island. Our impression was of a rugged mountain range thrust up from the sea (which it is), but it is also much more. 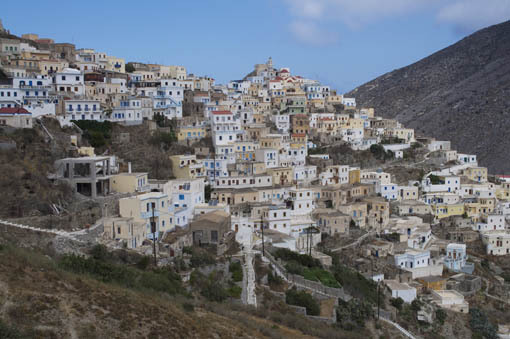 Karpathos is a craggy, sparsely populated island with a unique characteristic: many of its people still live by traditions that others have forgotten in modern times. 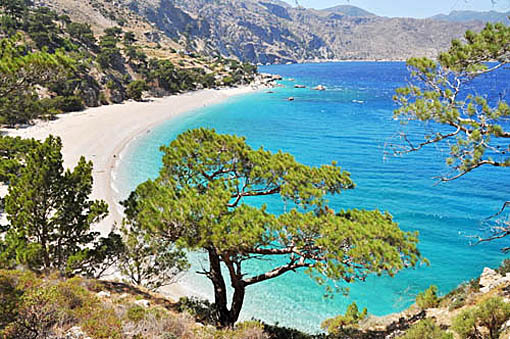 Some say it is the most truly Greek island in Greece. 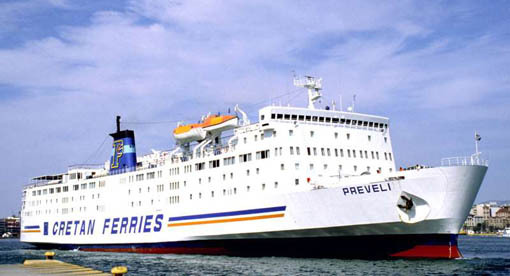 Our ferry docked at the main town of Pigadia, the only port that can cope with large ships. 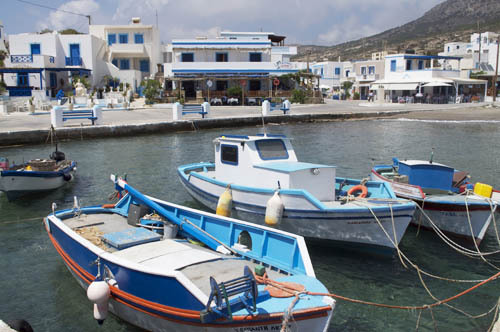 Actually, there are only two ports on the island — not counting shallow bays where smaller boats anchor. Wind was the first thing we noticed when we stepped off the ferry. 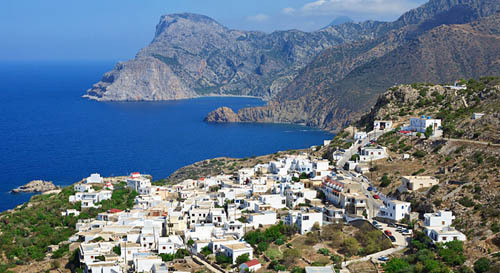 Homer, the famous epic poet, mentioned Karpathos in the Iliad, and called it “the windy island.” This is because the mountains and canyons focus and intensify the Meltemi winds that sweep across the sea during summer. 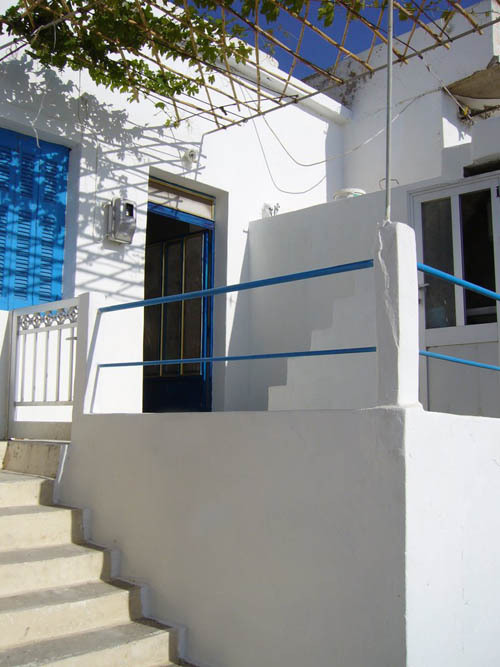 We were told that Karpatians build their houses with doors facing away from the incoming wind. Our island guide (Eleni) was waiting at the dock. She took us to our hotel, where she explained our travel agenda. After settling into our room we went looking for a place to eat supper. Waterfront cafes seemed to be geared towards foreign visitors. 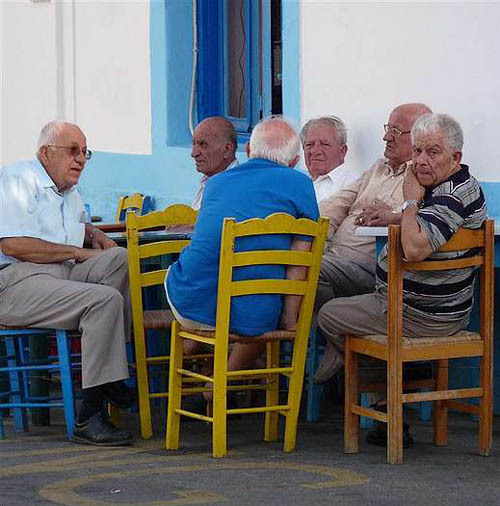 As usual, we searched the backstreets for tavernas where local people eat. We found Mike’s Place, where the owner recommended Karpathian sausages — which were unique and delicious. The next morning we rose early, had a quick buffet breakfast, and boarded a bus that returned us to the harbor. The Chrysovalantou, a well-maintained wooden ferry was waiting for us at the dock. Eleni stood at the gangplank to explain our voyage to the port of Diafani, and then onward by bus to the mountain village of Olimbos. We learned that our bus driver (also at the dock) was Eleni’s mother. The captain of our ferry was her uncle, and the crew were relatives. 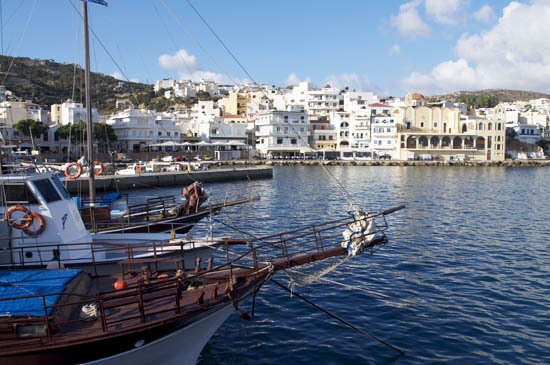 Family businesses are common in Greece — and especially on Karpathos. The trip north to Diafani was educational. 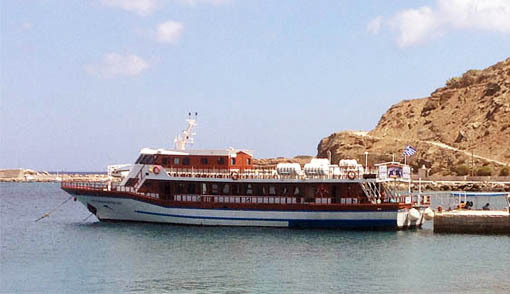 When we first arrived on the big ferry, the island appeared to be rocky and desolate. Cruising near the coast, we could see that pine forests covered the mountains and extended down to the edge of sea cliffs. It is much greener than we had thought. 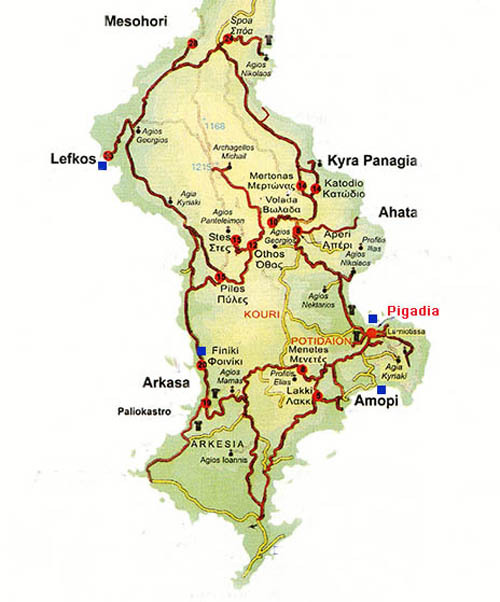 Smaller and less touristic than Pigadia, Diafani is proud of its rich cultural traditions. This was obvious in the people — especially women — going about their daily chores in traditional clothing. 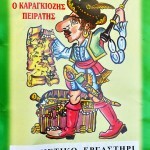 Karpathians are very conservative about their way of life and their clothing, and even their language — which includes several unique dialects (one of which is similar to the Cretan dialect). While waiting for our bus, Eleni gave us a quick tour around the harbor area. 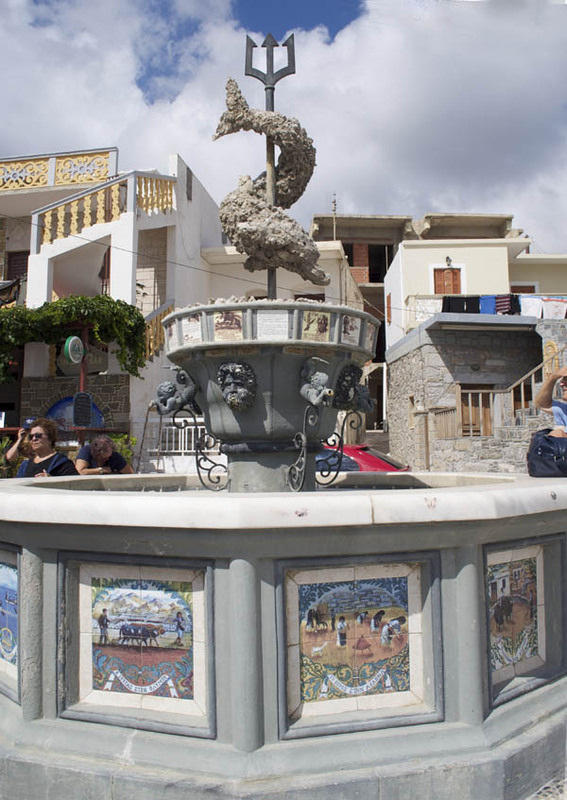 One of more interesting sights was the “Fountain of Poseidon,” the base of which was ringed by hand-made tiles depicting traditional activities on the island, and tiles on the upper basin portrayed heroes of the past. The tile images depicted the clothing Karpathians wore in the old days. 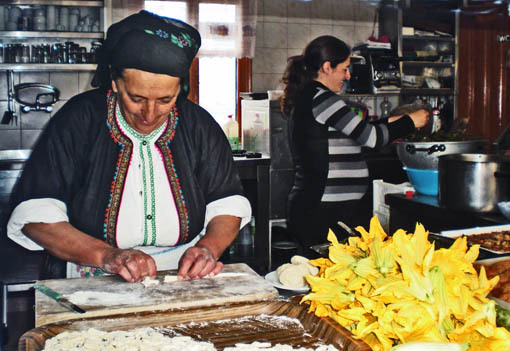 There have been changes in recent years, but many women still wear the traditional dress with colorful embroidered vests and aprons. 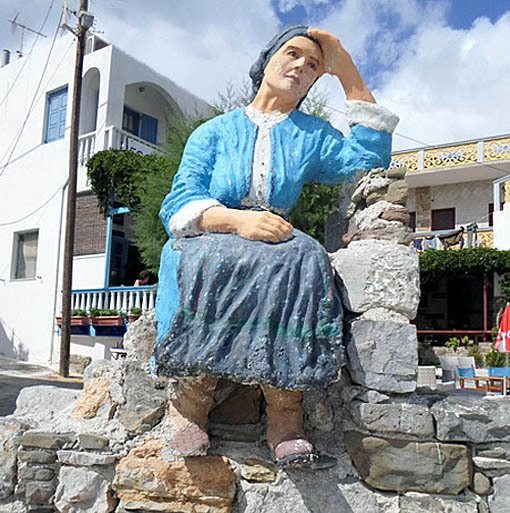 On a nearby stone wall was a statue of a traditional woman looking out to sea, perhaps awaiting the return of her husband’s fishing boat. Eleni’s mother arrived with our bus before we had a chance to see more, so everyone boarded for the ride to the village of Olimbos. It was a short trip — only 5 miles on a new road— but rather unsettling. 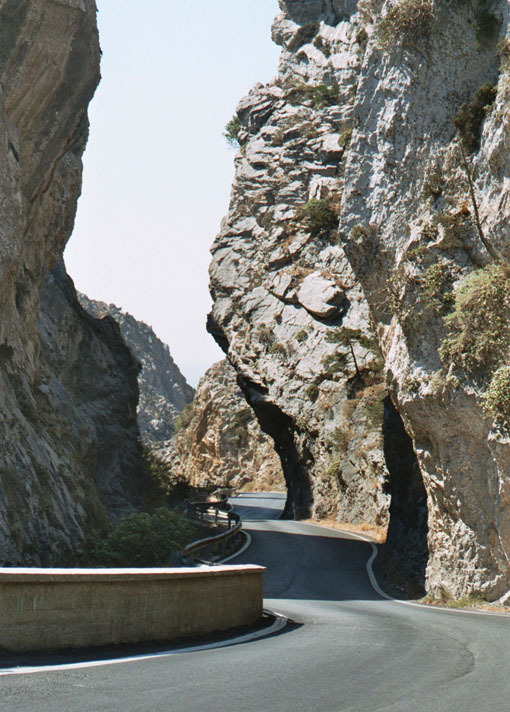 The road (which has no curbs or guardrails) twisted and turned along the edge of deep gorges. Between crags and cliffs, we passed ancient donkey trails and foot paths, as well as farming plots wherever there was enough soil to produce crops. Our bus had to park outside the village, because its steep and narrow lanes were designed for foot traffic and donkeys. With only about 400 residents, the village is a living museum, where traditional clothing, crafts, music and a local dialect are preserved. They used oil lamps and candles until electricity came in 1980. Because it is remote and has few lodgings for outsiders, the village is not clogged with visitors. 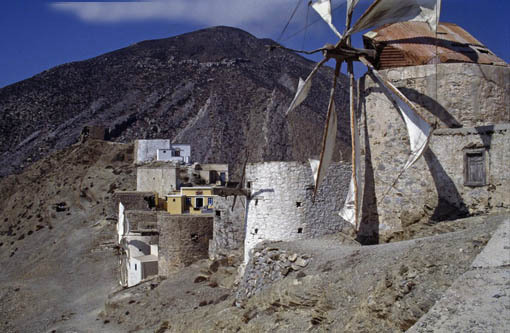 Above the village, along a mountain ridge, is a string of ancient windmills. There are 75 of them on the windy slopes near Olimbos. 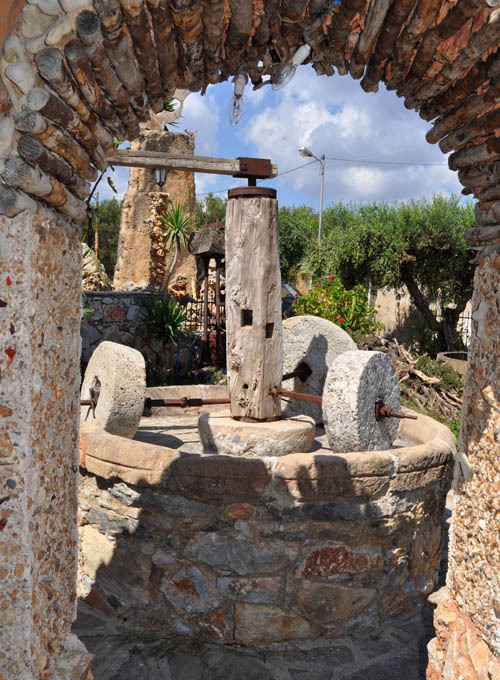 Most are ruins now, but four of them are still used to grind wheat and barley into flour for bread. During the hard years of World War II, Olimbos windmills and highland agriculture fed everyone on the island. 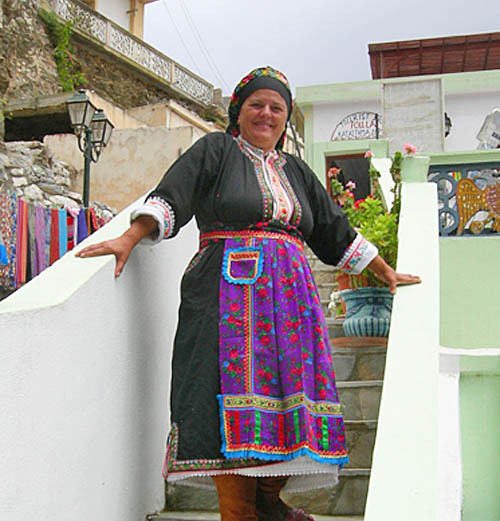 Walking towards the village, we quickly encountered a smiling woman in traditional clothing with a colorful head scarf. She wanted to interest us in some of her weavings. 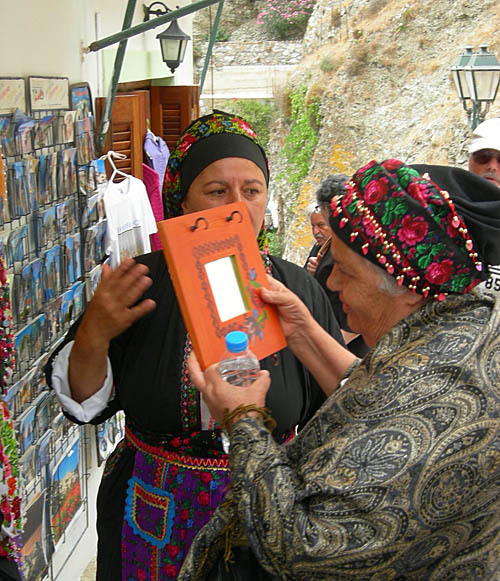 Many of the traditional folk costumes of Karpathos have been lost, except in the village of Olimbos, where inhabitants cling to the old ways. Karpathian clothing is symbolic — more so in the past than in modern times. A hundred years ago, the costume revealed the person. It was a status symbol that distinguished an upper class person from those of the lower classes. Now most traditional costumes appear to be very similar, with multi-colored embroidered skirts, aprons and scarves. The design of clothing worn by unmarried women and girls is somewhat different from that of their mothers. We strolled along a lane wide enough only for people and donkeys, and paused at the counter of a small cafe, where a woman was hand-rolling some type of pasta. We were told these were makarounes — a Karpathian specialty. 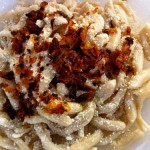 When someone mentions “specialty” we begin to fantasize about flavor, but it was early for lunch. 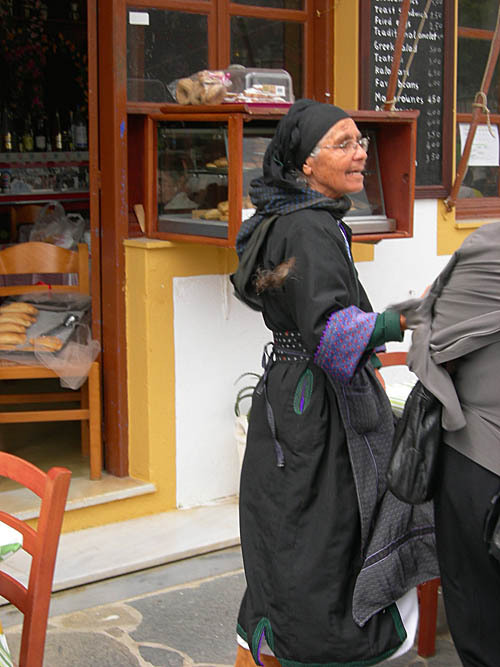 Continuing through the village, several of our female friends were attracted to a shop selling traditional headscarfs. Since we were heading towards the main church at the top of the village, those without head coverings for the church decided to buy. 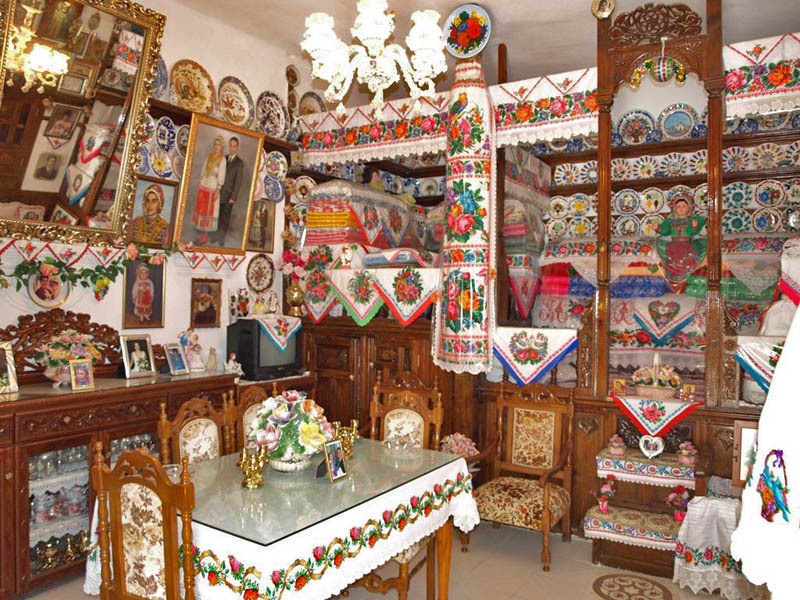 Farther up the lane, we were invited into a Karpathian house. Although many island homes exhibit art and handcrafts and family photographs, this one was actually more a museum than an actual living space. It displayed a marvelous family record passed down for centuries in the form of colorful embroidery, knitting, weaving, and woodcarving. 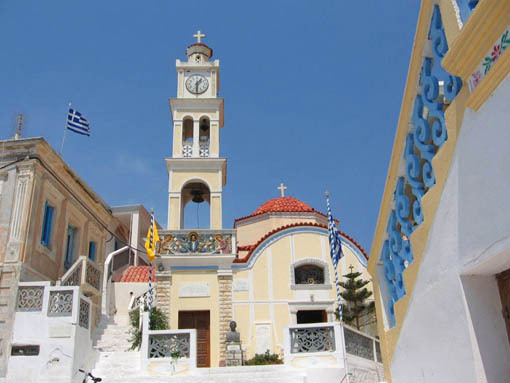 We made our way up to the central square at the top of the ridge, where the impressive church of Kimisis ti Theotokou (the Assumption of the Virgin) stands. 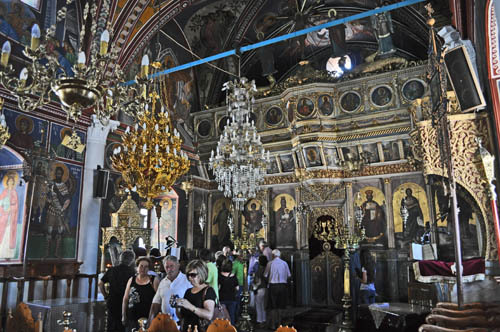 It is built in the Byzantine style and its interior is covered with murals dating from the years of Turkish rule. 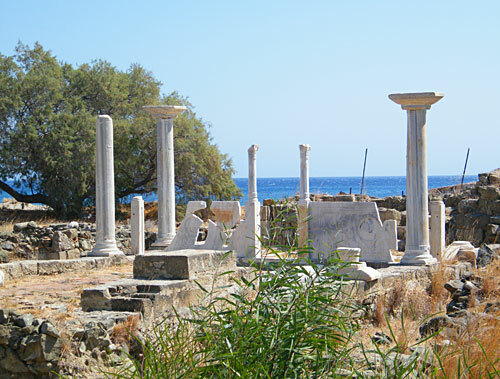 In the early days a much smaller village of Olimbos was located here, and fortified against pirates. In the center of the fortress was a church and a tower (now gone) from which watchmen scanned the western coast for the sails of pirate ships. Houses built on the western slope were not painted, so they would blend in with the mountain. None of the village houses had chimneys, which could also give them away. 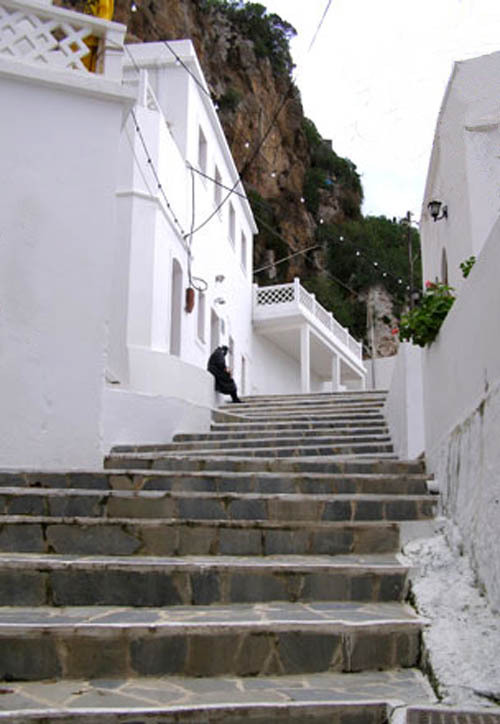 Climbing stairs to the square, we speculated that the bright colors of church and surrounding buildings were perhaps a celebration of freedom from piracy and the oppression these people had suffered for centuries. 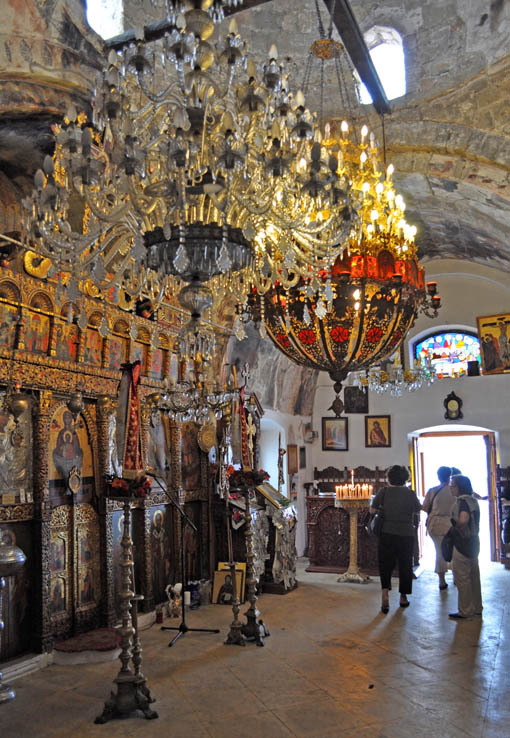 The interior of the church was a different world — filled with wall paintings, gold leaf, crystal chandeliers, religious icons, and countless candles representing the prayers of faithful visitors. After visiting the church, we wandered downhill, investigating side alleys until we found a small cafe near the edge of the village. We stopped for iced coffee frappes and chatted with the lady who owned the place. She spoke English quite well, and had a good sense of humor. Members of our group began to walk by, and when we saw our driver we knew it was time for the bus to leave for Diafani. The return trip to Diafani was not as anxious as the journey into the mountains, perhaps we were used to it at this point. When we arrived in town Eleni informed us that we had some free time to explore and dine before boarding the boat back to Pigalia. So we did explore the town, and spent some time in their little natural history museum. 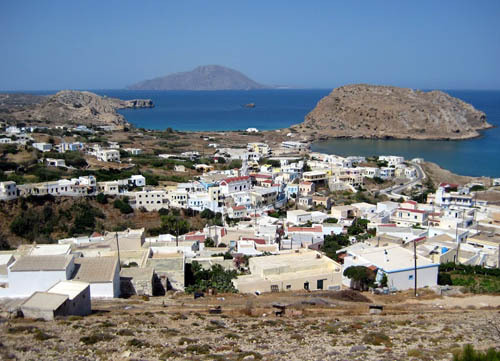 We discovered that a large part of Karpathos is a refuge for various endangered species. 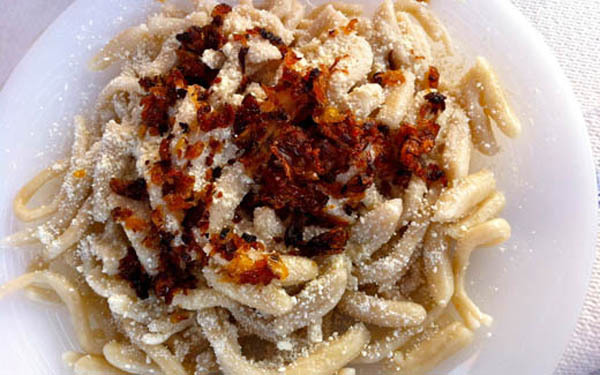 Makarounes topped with caramelized onions and grated goat cheese became one of our forever favorites. NOTE: There are multiple spellings of the name Olimbos. Because there is no “y” in the Greek alphabet, and the letters “mp” are pronounced as a “b” there is some confusion when translating to English. Depending on what reference you find, the name of this village may be spelled Olympos, Olimpos, Olibos or Olimbos (which we saw on several maps and road signs). 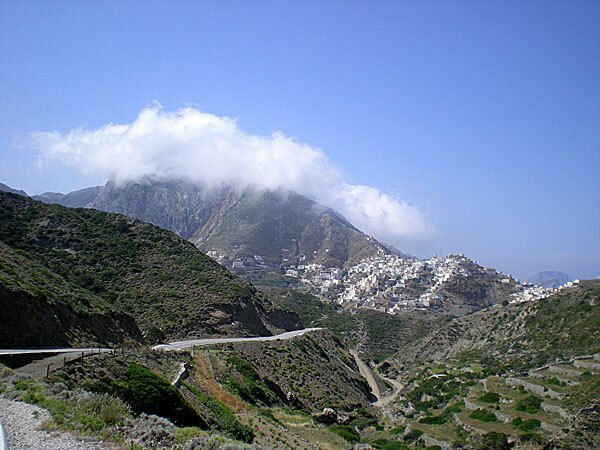 This is not to be confused with Mount Olympus (home of the ancient Greek gods), which is in northern Greece. Postscript: Accounts of our travels over the following days are published in the next few articles below, so that they appear in sequence. Shortly after breakfast, we walked up the street to an old stone well to meet our bus. 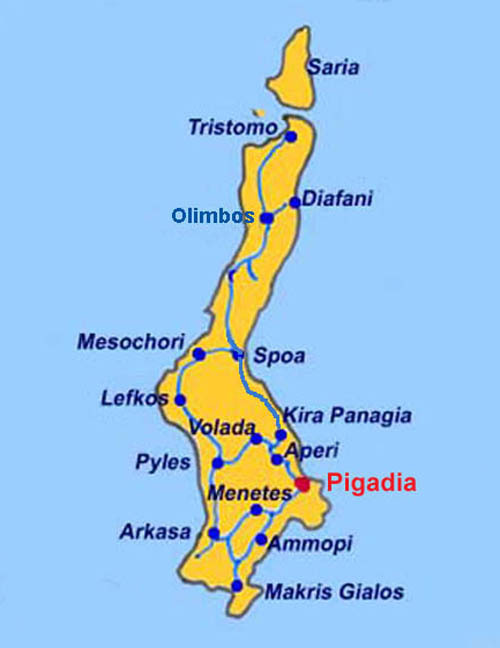 Pigadia is known for its wells and excellent water (in fact, Pigadia means “wells”). From there we traveled northward, climbing into forested hill country until the road veered towards the eastern coast. Moving through the highlands, we could see beautiful sandy coves at the foot of high cliffs off to the right. Some of these beaches are accessible only by boat; others can be reached on steep roads that look barely passable. Turning away from the coast, we traveled westward through oak and pine forests. Many of the trees were bent and twisted in the same direction. They grew this way due to the nearly constant assault of winds that blow here. The forest thinned near the west coast, and we were soon able to see Mesohori perched on a high cliff overlooking the sea. The view was fantastic! We turned down a side road towards Mesohori, but had to park at the edge. There are no regular roads into this traditional village. Everyone walks. 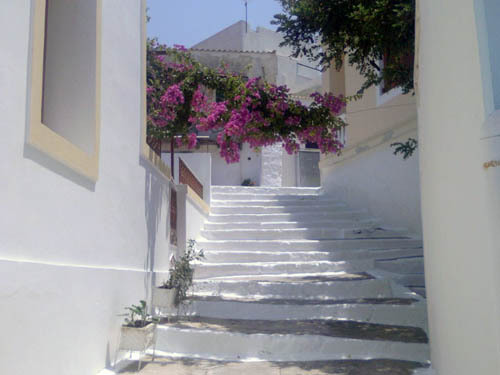 We descended into the village on stone stairs so steep that the doors of adjacent houses were on different levels. There were only a few elderly local women on the stairs. Perhaps most of the residents were tending the fields and orchards outside the village (they still live a traditional lifestyle). Most of the antique homes we passed appeared to be in new condition, and surrounded by colorful arrays of flowers. There were only a few houses awaiting renovation. Eleni (our guide) took us to one house and knocked on the door. She had apparently called in advance to let the owner know we would be visiting. A lady and her adult son greeted us with smiles and invited us inside. The main living/sleeping room had a traditional sofas, decorated with weavings, hand-made linens and lace, and the panosoufi platform for sleeping. 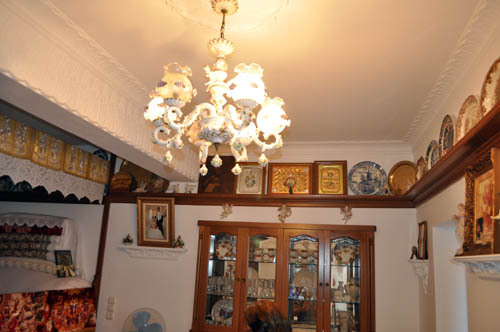 There were wood carved shelves holding decorative hand painted plates and family portraits. Our hostess was happy to explain everything about this traditional home. The most appealing fact was that this was a real home — unlike the display house we had seen in Olimbos village. It even had a modern kitchen, where our hostess had prepared several plates of snacks to pass around. After our visit, the woman’s son motioned us to walk a few doors down the lane to his home. 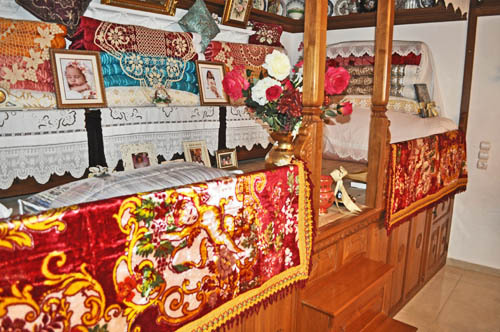 It was similar to his mother’s house, with a wooden sleeping platform, family photos, and other decorations. However, the absence of brightly colored weavings and lacework suggested that he was unmarried. Continuing down the stairs, and down and down, we finally reached the level of the stone-paved platia, where there are two small churches. One of them is on the edge of a cliff that plunges almost straight down to the sea. 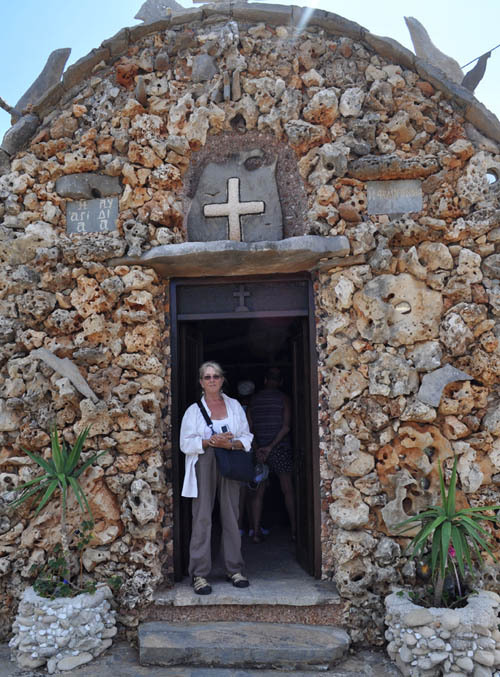 Since the village was built here as a defense against pirates, it is not farfetched to imagine a village priest ringing the church bell as a warning when suspicious ships appeared on the horizon. 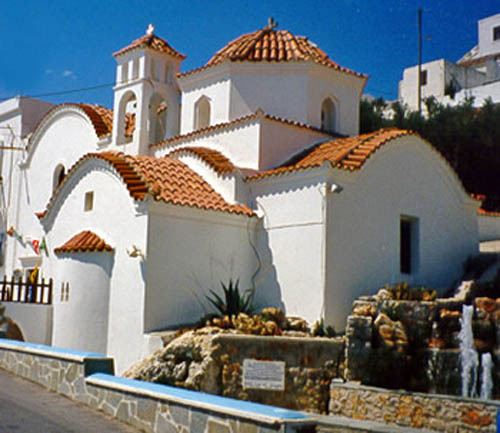 Not far away, the church of Panagia Vrissiani (Nativity of the Virgin Mary) now serves as the main place of worship for villagers. Chairs and tables stacked under a pergola near the church indicated there had been a recent festival (there are many in this village). 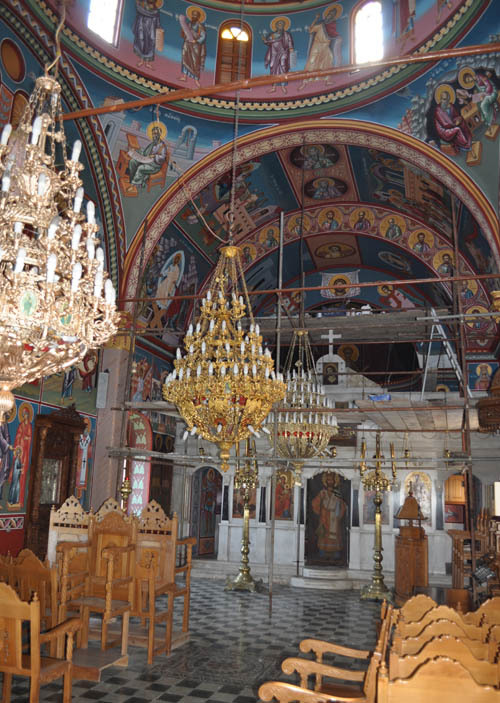 The architecture of Panagia Vrissiani is appealing and the interior is filled with marvelous religious art and ornamentation. 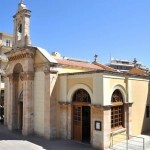 After exploring the church, one of our friends (Manolis), was inspired to sing a religious song with his wife and son. Manolis has a wonderful voice, which attracted others of our group to join in. Soon the church was filled with beautiful choral music. Outside we found stairs leading to a grotto under the church. 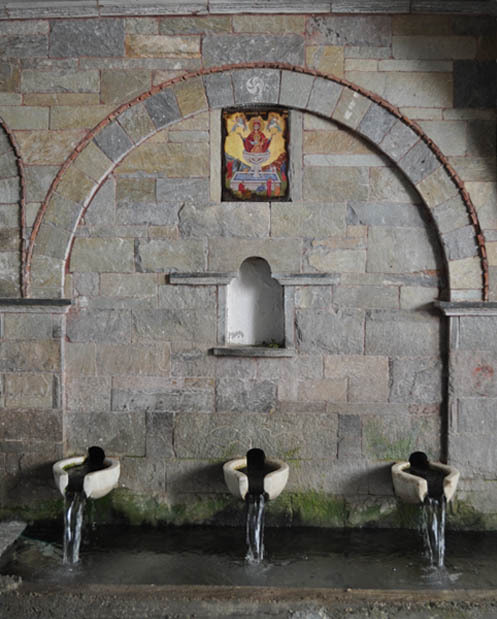 Panagia Vrissiani is actually built over a natural spring, the main source of water for the village and all surrounding farmlands. Folklore declares that a woman who drinks from this spring will be married with a Karpathian. I noticed a few women collecting water in bottles. After our church visit it was time to hike up the daunting stairs to the top of the village. Up, up, and more up, until we were finally on the road. Catching our breath, we stopped at a quite taverna and ordered coffee frappes. We sat on the balcony and enjoyed the view of Mesohori. Our bus continued southward, into a rather desolate area. Much of the green forest south of the village was burned away because of the foolish act of one person. 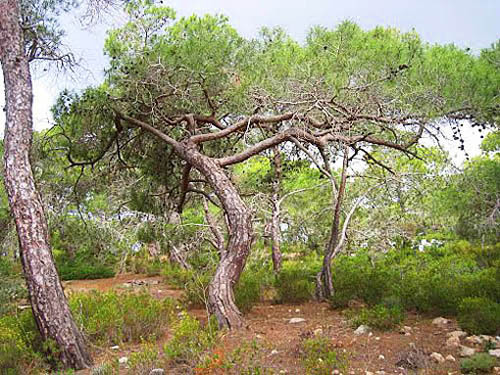 The island lost more than 30,000 acres of pine forests. We saw that pine seedlings were beginning to take hold, but it will be many decades before the forest recovers. Nearing the seaside village of Lefkos, we reached the edge of the fire zone, and could see green forests saved by the firefighters. 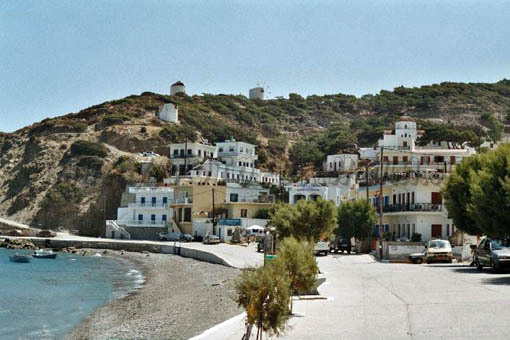 As in Mesohori, our bus had to part outside the village, and we hiked down to the shore. 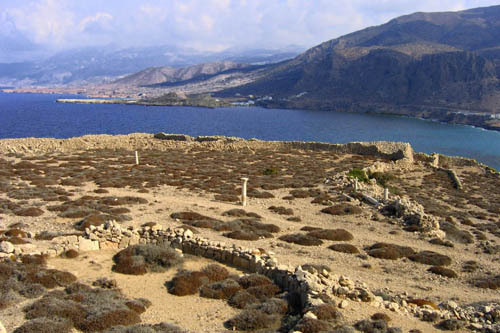 Below us was the shallow bay, encircled by Lefkos. It was much smaller than we expected, and now given over almost entirely to tourism. Along the way, we saw a sign pointing the way to an archaeological site. Nearby was an underground cistern, which once served a Roman settlement in this area. Not far from the cistern is a strange community of stone-built houses and stables hidden in a cavern that locals call Kamara (“chamber”). It reminds one of ancient Indian cliff dwellings in the American Southwest. No one knows how many generations of people found shelter here. 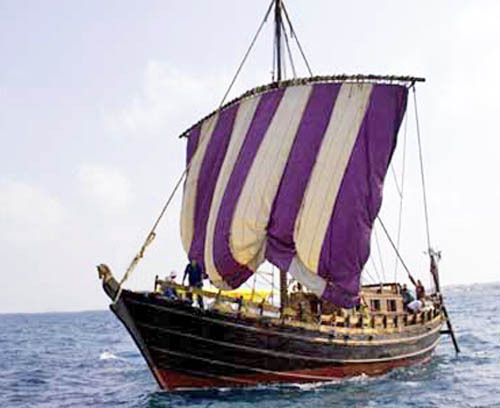 Considering the history of invasions and piracy suffered by Karpathians, such secrecy is quite rational. 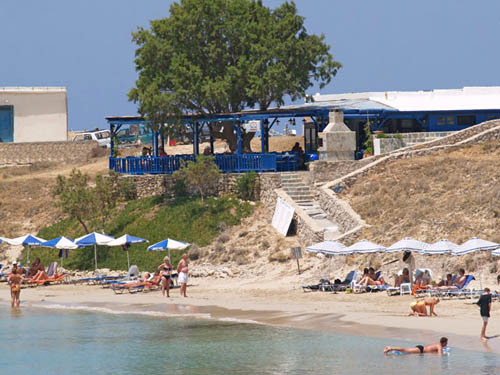 In the village, we found a pleasant taverna above the beach, where we could sit in the shade, enjoy the sea breeze, and have a relaxed lunch before returning to Pigadia.